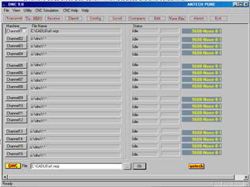 ANACAM from Antech is CAD based software for NC programming of CNC TURRET PUNCH PRESS machines. It allows user to take full benefit of geometry making of any CAD software. 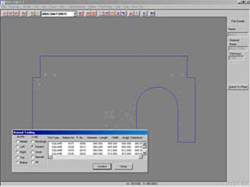 And with least questionnaire it converts dwg files into NC code compatible with CNC TURRET PUNCH PRESS of various makes. Software takes care of tool mapping, sequence of cutting, automatic shape recognition etc. After completing profile drawing in CAD, user can call ANACAM module & prepare part geometry along with automatic tool mapping. Best fitted tool will be mapped. It also takes care of clearances and punching technology to map a tool. Module is intelligent enough to overcome small discontinuities (common problem with CAD users) and generates tool path automatically. ANACAM provides the flexibility to the user by allowing to alter the tool mapping. User can map a tool of his choice from the available tools in the tool database. GUI is very useful in performing the tooling. Manually mapped tools goes into optimized tool path generation. Manual tooling has an option of aligning tools with edges like left, right, up, down. Tool modification is performed automatically. Cutter path file is universal and is converted to final NC code with this module. Post processors for AMADA, TRUMP, FINPOWER etc are presently available and generation of new one does not take much time. Post processor module take necessary inputs from the user and generates NC code compatible with CNC control. Specialized module to simulate Tool path motion in graphical form enable user to confirm tooling sequence. In case of any left out tooling user can move to manual tooling and make corrections. Micro joints can be seen. Repositioning is also taken care of in the simulation. 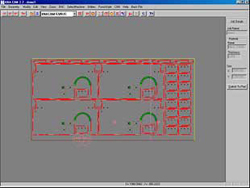 Simulation can be seen in single step mode as well and dimensions also can be seen for verification. Part with tooling can be taken to a specified plate and place as required. Various options like copy, move, fit, array etc are available to make a optimized plate layout. Parts also can be fitted with common slit option so that tooling is minimized. Manual nesting, cutting directions, some entity insertion also can be done in this module. Full true shape nesting also can be done with additional module. Generated NC programs can be transferred to CNC machines directly via RS232 port. Once DNC is active at PC end, NC programs can be called from CNC. This module can be used only if RS232/422 port is available with CNC. If RS232 port is not available, other DNC peripherals like RE93, 20 MA, TTY can be used for PC-CNC communication. 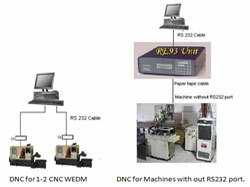 Multiple CNC machines can be connected to DNC PC with additional hardware. Crompton greaves, Nasik having AMADA CNC turret punch press were looking for a solution for NC programming for their CNC TPP. There were so many softwares available. However Antech's ANACAM is the only software which does not allow geomentry modifications at NC programming place. So that latest revised design is available in the shop floor for producing components. Automatic tooling and automatic optimized NC program generation is very useful and leaving less programmer's intervention.